That is why the previous example was a demo, every image has to be taken on its own. Tutorials that claim, this is how to do xxxx very rarely succeed overall. From the previous image, you have seen a selection and how quick mask can modify (and create) a selection. 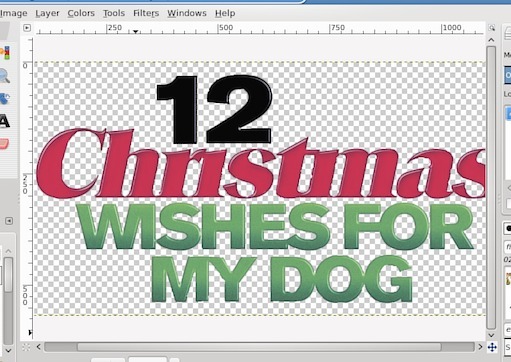 If I was doing that I might use the paths tool to cut out the lettering. Steep learning curve for a beginner. Again use add mode - you know this one now. but click around each letter in turn, pressing enter when you complete each letter. Now this might take you 10 or 15 minutes so save as you go along. If you save as a Gimp .xcf file then any active selection is saved as well. Any disaster and you can revert to the last save. Be prepared to spend a lot of time using the quick mask refining the selection, painting in and out using black and white. Even so you can do better, here is the the gimp file with selection for you to improve on. http://www.mediafire.com/download/0is1z2...hes.xcf.gz too large 1.5 MB to post here. Going back to the first posts, a better way is to create your own logo. What are the problems. 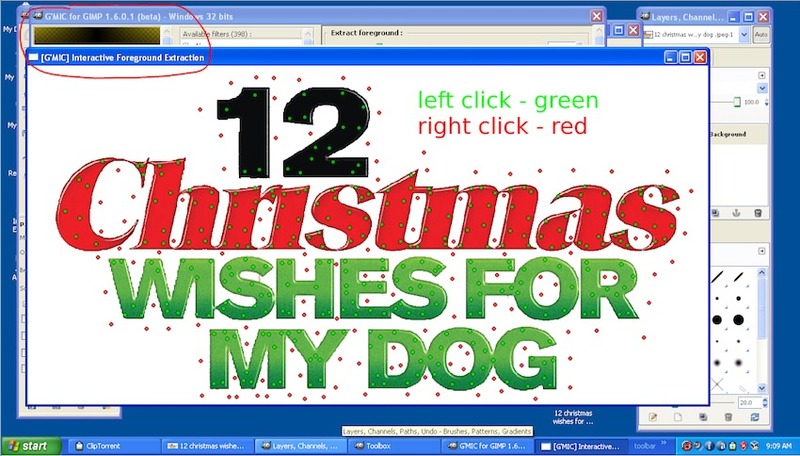 The 'Christmas' font is proprietary although there is a similar free font. You are going to need to learn a little about bevels and shading. end of the day it will be a better image. Mostly straight lines, but with a few curves, an outline using the paths tool works as a basis. A path can create a selection which can remove the background. This one has the original as a layer, an edited layer and the path as an example. 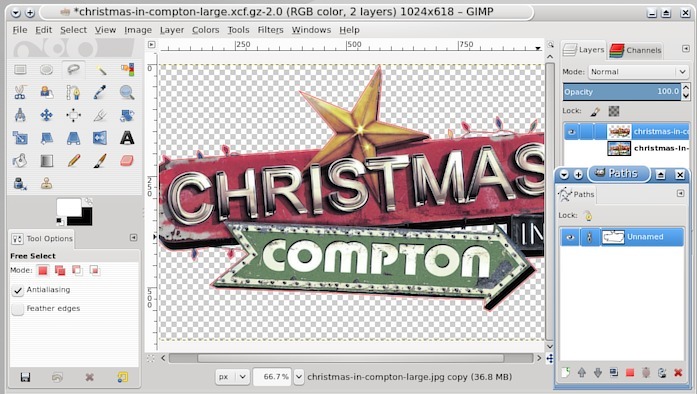 Gimp does open a .xcf.gz file directly, no need to do anything to it. @gizmo - still using Gimp 2.6? Absolute last demo, this time using a path to create a selection. http://www.youtube.com/watch?v=opw72piwe4o&hd=1 10 mins, 5 minutes more than I like. Do not fall asleep half way. The best way to learn is by experiment, see what works for the type of graphics you have. Plain colours maybe color select, more complicated free select or magic scissors. As this demo, try the paths tool to create a selection. Always think about a quick mask to refine a selection. Paint in straight lines by holding the shift key down. That works for the eraser tool as well. You have seen all those in action, Gimp is a complicated application, expect setbacks. Do not try to be too ambitious at first, learn the basics, keep experimenting. hi thank you for your help i am still useing gimp 2.6 because when i am trying to use 2.8 the only screen that opens up is the canvas screen no tool box etc , it did open once then every time i try and open 2.8 all i got was a canvas screen so i trying 2.6 . Away from work miracles, but it's still a new option. Gmic foreground extract is looking very good. 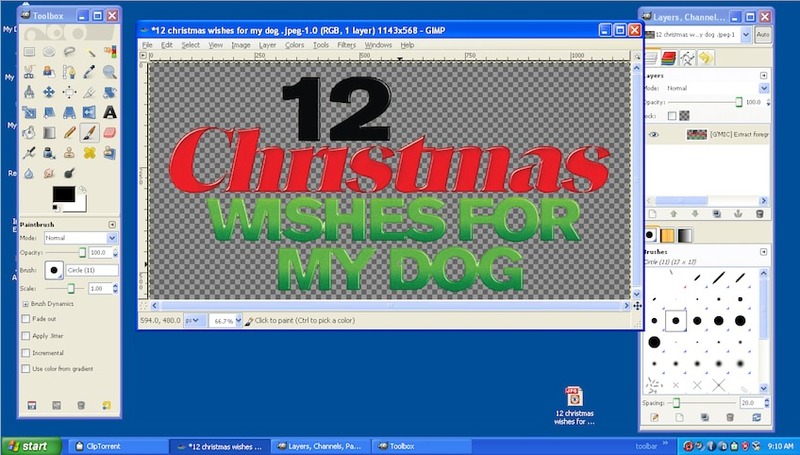 Better than the Gimp tool. I have been trying this for the last day or so since the beta came out. http://sourceforge.net/projects/gmic/files/beta/ look for files starting gmic_gimp (not plain gmic). http://i.imgur.com/jEWTXaB.jpg looks like a bad case of measles probably more control points than necessary. http://i.imgur.com/nxEpcCm.jpg close up, a little bit of touch up required, depends how keen you are. There is a windows installer, I always avoid these and use the zip then put plugins in my Gimp profile. 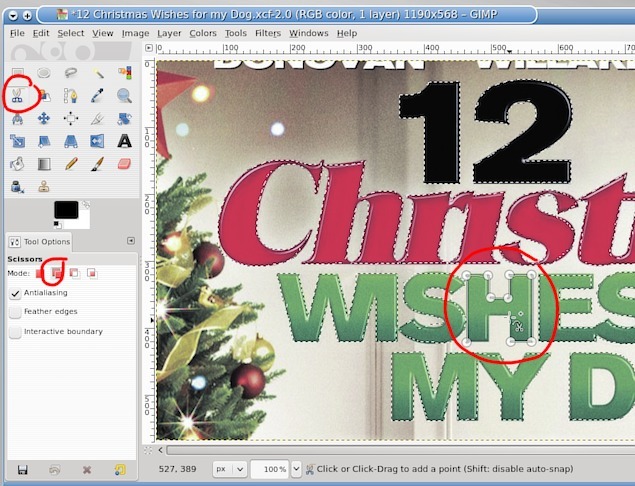 @gizmo If a plugin makes editing easier for you that is great but do not ignore the basic tools that come with Gimp. You will need them. What operating system are you using? Windows XP\7\8 32 or 64 bit? 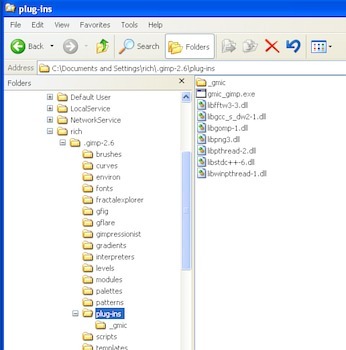 Find your gimp profiles, there should be one for each Gimp version. Delete these folders and that should be Gimp removed. Be very patient with the installation and first run of gimp, this can take some time. Gimp 2.8 starts up in the same 3 window mode as Gimp 2.6 Use the Gimp Windows > single window mode option. Do that, give us the info on your OS. Report any snags. Does that mean you deleted those files shown in the last post? You do get 3 windows like this http://i.imgur.com/0fMFb1q.jpg keep them in that order. but go into that menu shown and tick single window mode. Not a problem provided everything works? That is caused because Gimp inherits settings from previous gimp installations. That is why re-installing Gimp rarely does much good with out deleting or disabling your Gimp Profile. No matter. You can reset gimp without a reinstall in a couple of minutes. Once you have Gimp up and running with all the dialogs back let me know, and I will post a demo of that new G'mic filter.